The public relations committee for Hunger and Homelessness Awareness Week (HHAW) created the window display in Falvey “to raise awareness on campus about the issues of hunger and homelessness in the local community and world-wide. Through education, service and advocacy, we are committed to promoting solidarity with the poor,” said Sasha Ducey, the committee chair. She and her three assistants, Jenna Dilorio, Robyn Bastian and Skye Jang, mounted the exhibit after consulting Joanne Quinn, Falvey’s design specialist. Quinn created the large central “Hunger and Homelessness Awareness Week” poster. All other graphics are the work of the HHAW public relations committee. Hunger and Homelessness Awareness Week , this year Nov. 9-16, is affiliated with Campus Ministry and the Center for Peace and Justice Education. In 1975, the Rev. 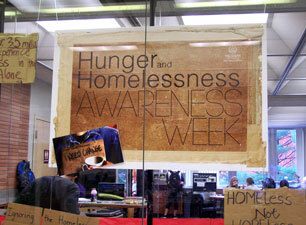 Ray Jackson, OSA, organized a few students to establish Hunger and Homelessness Awareness Week. Although Father Jackson died in 1997, his legacy lives on. More than 500 colleges, universities and other groups now participate in HHAW. This thought-provoking, stark display makes a visual and verbal statement about the plight of those who are hungry and/or homeless.